(Best National Parks Of India) India is globally famous for its historical glory, cultural values and religious grandeur among other things. But out of all these treasures, one of the fascinating features is its rich wildlife and diverse flora and fauna. India is home to many of the critically endangered animal species including tigers, snow leopards, star tortoises, Great Indian bustard, etc. Most of these animals, being on the verge of extinction, are found only in national parks and protected sanctuaries. There are more than 100 national parks in India. These national parks are a major tourist attraction and contain a great variety of wildlife along with stunning landscapes and beautiful lakes. They offer a chance to see majestic creatures face-to-face and providing thrilling experiences. This makes them the go-to place for adventure-seeking tourists. Hence, below are listed 8 of the best national parks of India that every wildlife lover must visit! At number 1 in our list of Best National Parks Of India is the Jim Corbett National Park. Found in 1936, originally named as Hailey National Park, it is India’s first national park. This park was named after a well-known hunter of his time, Jim Corbett. Having about 200 tigers and over 100 leopards, the park houses one of the largest numbers of tigers in India. Spread across more than 1300 sq. km, other animals living inside the park include gharials, sambar deer, jackals, wild elephants, etc. This park provides lodges and cottages inside the park itself, further aggravating the experience for tourists. More so, there are more than 550 bird species residing in this park. Ranthambore National Park is located in Rajasthan and is one of the most famous parks of India. It derives its name from the Ranthambore Fort which is situated at the center of the park. The major attractions inside the park are tigers, crocodiles, and leopards. Though many other animals too are found here like nilgai, spotted deer, jackals, wild boars, etc. The park contains around 65 Tigers, on whom many short films have been made over the years. The most famous tigress of Ranthambore is ‘Machali’. Machali died in August 2016 at the age of 20, being the oldest Tiger to ever live in the natural habitat. This national park is an ideal holiday destination for the animal as well as history lovers. Hence, it is at number 2 in our list of best national parks of India. Located in the Ladakh region of the state of J&K, Hemis National Park is the largest protected area in India. The national park is hugely famous for having a glimpse of the very rare snow leopard. It contains around 200 snow leopards, the largest number of snow leopards in the nation. Along with this, other less common animal species found are the Tibetan wolf, Blue sheep, Eurasian brown bear, golden eagle, etc. Another beautiful feature of the park is the serene mountains and the adjoining valleys. Hence, this is probably the best place to be if you wish to see uncommon animals and snow-covered landscapes. Kaziranga national park is a World Heritage Site in Assam. Almost no other park can match Kaziranga in terms of wildlife diversity. The park is home to large numbers of Great One-Horned Rhinoceros, water buffalo and swamp deer. It contains around 2400 rhinos which are almost two-thirds of the entire population of Great One-Horned Rhinos in the world. Kaziranga is equally famous for its bird life. This consists of a vast variety of birds like pheasants, Indian vulture, white-bellied heron, pelicans, etc. All in all, the park comprises of 35 species of mammals. Situated in eastern India, the park lies in the state of West Bengal along the Ganges Delta. Sunderbans is a Tiger Reserve and a Biosphere Reserve. This park mainly contains endless mangrove forests and is a World Heritage Site. Apart from tigers, other animals residing here are the salt-water crocodile, Indian grey mongoose, jungle cat, flying fox, turtles and much more. The region is actually shared between India and Bangladesh. Contrary to other national parks, there are no jeep safaris here. Instead, traveling inside the park is done through seaways only. Another gripping fact is that the Tigers here have learned the rare quality of swimming in these muddy waters. 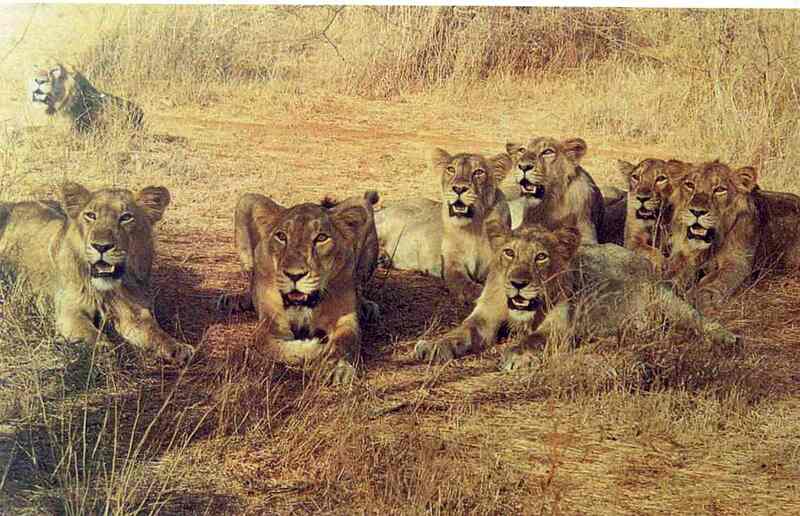 Originally known as Anshi National Park, the Kali Tiger Reserve is situated in Karnataka. This reserve is a protected area and contains lush green forests with the Kali river flowing through its heart. The main interest here is the tiger, but another feline that one ought to look out for is the mystical black panther. Though rarely seen, the black panther is found at very few places in India and Kali Tiger reserve is one of them. The park also contains a wide variety of fauna including sloth bears, mouse deer, leopard cat, Indian bison, etc. Reptiles found here are Russell’s viper, Indian cobra, and king cobra. While birds were seen include the Great hornbill, Black-crested Bulbul, eagles, owls and much more. 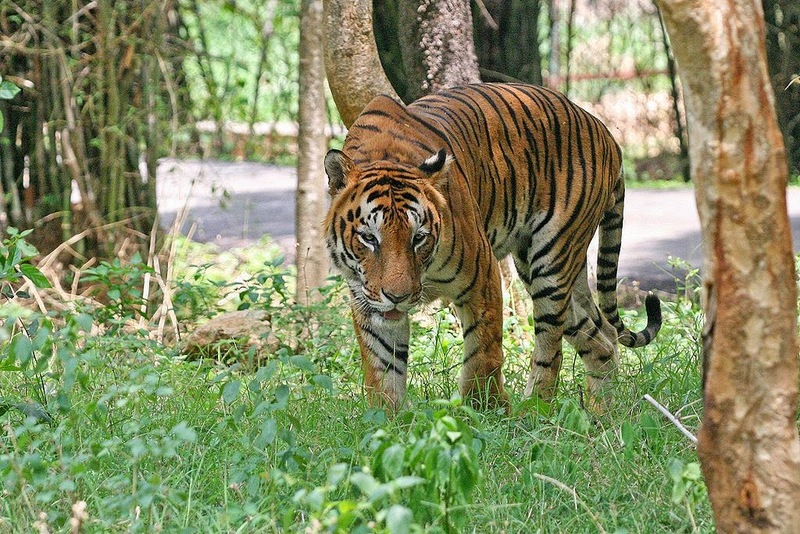 Another perfect place to spot the striped beasts is Kanha National Park. This park is sure to give you one of the most thrilling moments of your life. It is immensely dense and spans roughly 2000 sq.km. The park is located in the state of Madhya Pradesh and is one of the most famous parks in India. It is home to some endangered species like the barasingha and the black buck. Other than these, animals living in the park are chital, foxes, rat snakes, leopards and much more. A very rare animal which is believed to be found here is the Indian wolf. Birds that can be spotted here are parakeets, peacocks, red junglefowl, kingfishers, etc.